Edward Everett Hale was an American Unitarian minister, a social reformer, and a prolific and versatile author. Edward Everett Hale, born in Boston, was a descendant of eminent New England families on both sides. His father was a newspaper editor and his mother an author. After preparation in private schools, Hale entered Harvard at the age of 13 and graduated at 17. While still in college he worked as a part-time reporter; soon after graduating he initiated his career by contributing to magazines. He studied theology independently and was licensed to preach in 1842. He became pastor of the Church of Unity, Worcester, Mass. (1846-1856), and of Boston's South Congregational Church (1856-1899). He married Emily Perkins, a member of the crusading Beecher family, in 1852. Hale was a leader in the Social Gospel movement of the last half of the 19th century and a forceful advocate of emigrant aid, African American education, worker's housing, and world peace. In 1903 he became chaplain of the U.S. Senate and did not return to Boston until shortly before his death there, on June 10, 1909.
of America by a Southern sympathizer and was based, vaguely, upon an actual incident. "The Man without a Country" concerns Philip Nolan, who, while on trial with Aaron Burr for conspiracy, shouts, "Damn the United States! I wish I may never hear of the United States again!" Taking him at his word, the court-martial condemns him "from that moment Sept. 23, 1807" never to hear his country's name again. A perennial prisoner aboard a U.S. naval vessel, Nolan "for that half-century and more" is "a man without a country." On his death bed, now a fervent patriot, he finally learns about his country's history since his punishment began. The story's verisimilitude and the public temper during 1863, the year of its anonymous appearance in the Atlantic, made it popular. It was reprinted as a pamphlet in 1865, collected in Hale's If, Yes, and Perhaps (1868), and republished scores of times. As late as 1937 it furnished the book for an opera. Hale's other writings, though less popular, were much admired. The writings he esteemed most were collected in a 10-volume edition in 1898 and 1900. Edward Everett Hale, Jr., The Life and Letters of Edward Everett Hale (2 vols., 1917), has the merits and defects of a biography written by a member of the subject's family. Jean Holloway, Edward Everett Hale:A Biography (1956), is the most useful study. 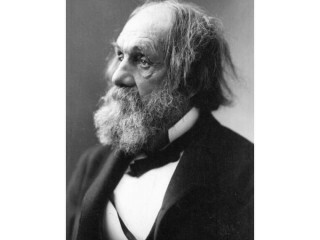 View the full website biography of Edward Everett Hale.